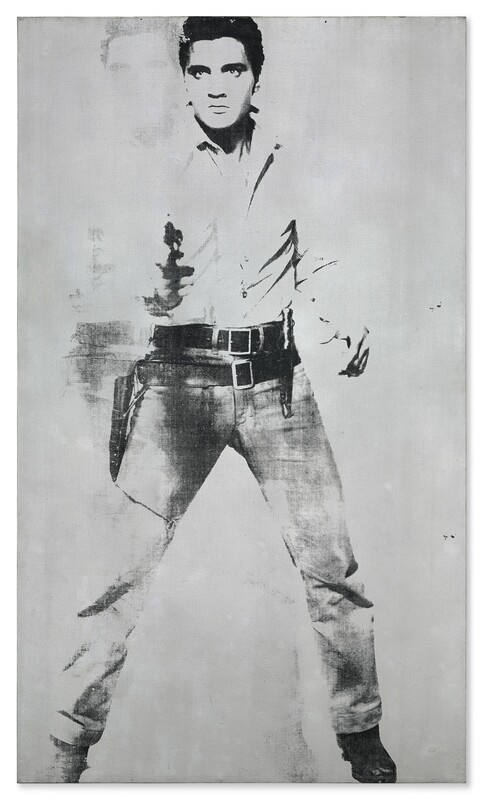 Christie’s just announced it will offer Andy Warhol’s Double Elvis [Ferus Type], 1963 with a whisper estimate in the region of $30m in a version that is a little more Elvis 1.1 than two times given the faint register of the second printing of the image. This work sold at Sotheby’s in 2012 for $37m which means were going to see another test of the Warhol market. The original Elvis series consisted of 23 works. MoMA in New York has a version of the Double Elvis [Ferus Type] with a sharp, vivid double printing that was donated by Jerry and Emily Spiegel in 2001. A substantial portion of the Spiegel’s collection has been a driver of the top of the Contemporary art market in the last few years. On May 17, Christie’s will offer Andy Warhol’s Double Elvis [Ferus Type], 1963 as a central highlight of its Evening Sale of Post-War and Contemporary Art (estimate in the region of $30 million). The silver Elvis paintings that Warhol made in the summer of 1963 represent the culmination of several series of celebrity portraits that Warhol made in the early 1960s..
Warhol’s Double Elvis does not portray Elvis the hip-shaking musician but rather Elvis the actor playing a role in the 1960 movie Flaming Star, a liberal-themed Western in which Presley plays Pacer Burton, a half-Kiowa youth torn between two cultures. The painting is a unique variation from a group of portraits of single and multiplied Elvises created especially for Warhol’s second solo exhibition at the Ferus Gallery in Los Angeles—the centre of America’s entertainment industry. Of the twenty-two extant ‘Ferus Type’ Elvis works, eleven are in museum collections, including the canvas Bob Dylan insisted on taking in exchange for his presence in a Warhol film, now housed at the Museum of Modern Art, New York. Double Elvis features two black screen-printed images of the King on a silver painted ground. A bold, high-contrast figure is accompanied by its ghostly duplicate, collapsing Warhol’s strategy of serialization into a single frame, while also providing an eerie reminder that Presley was a twin, his brother being lost at birth. When the crowd of cloned Elvises were shown at the Ferus Gallery, the paintings were both confrontational and an almost anonymous backdrop. The Ferus Gallery’s director, Irving Blum, had tried to press on Warhol the idea of a mini-retrospective, writing, “your exhibition should be the most intense and far reaching composite of past work, and the Elvis paintings should be shown in the rear of my gallery area.” Warhol, however, insisted on focusing on his new work and planned to utilize the gallery’s physical space as part of a highly conceptual installation. Before his arrival, Warhol instructed Blum to line the front room with his series of Elvis paintings and the back room with portraits of Elizabeth Taylor.